The BF-10 filtration system is designed for removal of solid contaminants from all types of mineral oils with temperature less than +50ºС and viscosity less than 70 cSt. The unit ensures purification to class 10 purity with initial class 14 purity ( contaminant content not more than 0,008%) in multiple passes of the purified product through the filters. 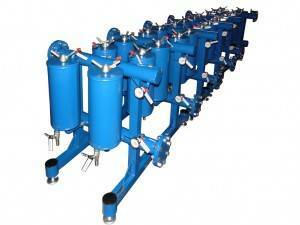 This system is applicable for installation, maintenance and operation of oil-filled equipment. Ambient conditions for operation: – ambient temperature + 10 to + 35°С; – atmospheric pressure 84 to 106,7 kPa (26.77 to 31.49 in.hg); – elevation up to 2000 m; – fire and explosion proof building. The filtration system consists of: – section 1, including 2 cartridge filters, 2 pressure gauges and piping; – section 2, including 2 cartridge filters, 2 pressure gauges and piping.